Invoicing a project in Current RMS is very similar to invoicing an opportunity, but you have the choice of which opportunity on the project to invoice for. Projects are a way to group together multiple opportunities in Current RMS, a bit like a folder. When opportunities are in a project, you can generate project documents that display information about all opportunities within that project. This means your customer receives one contiguous document, but internally you can manage each opportunity separately. Check out: What is a project? 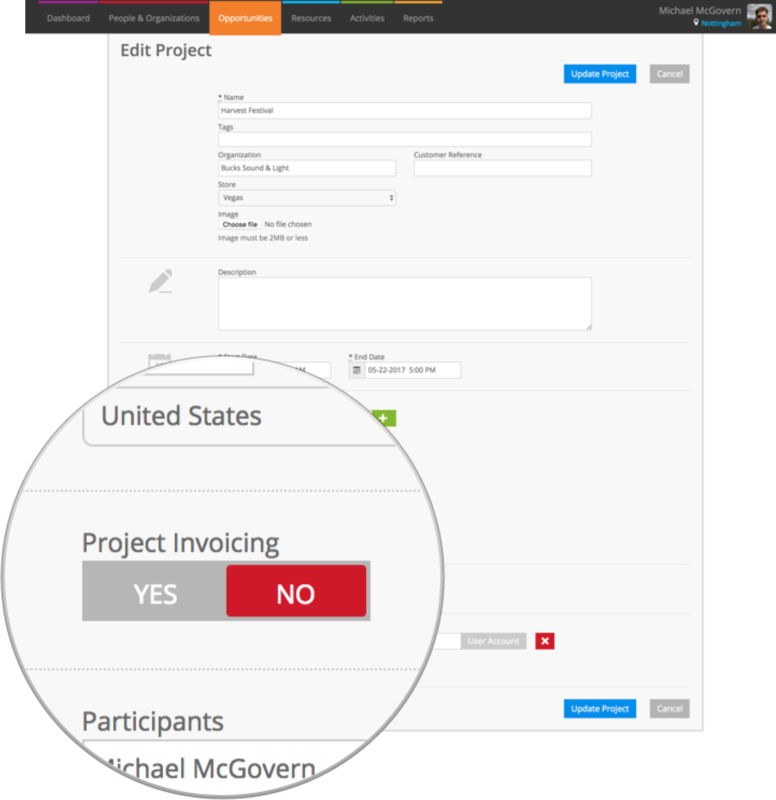 When creating or editing a project, toggle the Project Invoicing slider to YES to turn on project invoicing. You’ll see options to specify the billing address for the project and tax class. ⚠️ When enabling project invoicing on an existing project, tax will be recalculated on any opportunities with a status of open or active within the project. Current RMS will notify you if this results in a change to any of the opportunities. 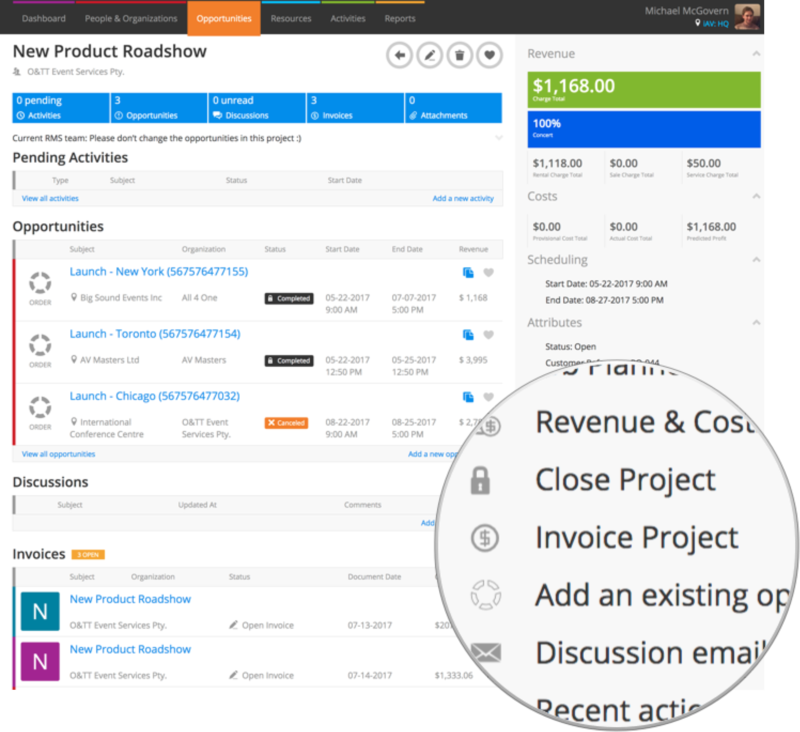 Head to your project page and click Invoice Project under Actions. You’ll see the project invoice screen. Tick the opportunities you wish to include on your invoice. Only opportunities at order stage that are not marked as invoiced show here. Your invoice will be grouped by opportunity and there will be a line for each opportunity item. Your invoice will be grouped by opportunity and there will be lines for each of the groups on your opportunity and their totals. Your invoice will be grouped by opportunity, with a line on the invoice for each opportunity item’s product group or service type with the total. Your invoice will have a line for each opportunity that you’ve selected. To generate an invoice for all selected opportunities, choose Standard Invoice. Want to raise an invoice for a particular percentage of a project? Hit Part Invoice and enter a percentage or invoice amount. If you’ve created one or more part invoices for this project, click Final Invoice when you’re ready to invoice for the balance. When you’re done, click the blue Create button to generate your invoice. At this point, Current will mark all of the opportunities you selected as invoiced. On your invoice page, you’ll see all opportunities linked to this invoice under Invoice Sources in the details pane on the right hand side. There’s no option to specify a billing address or tax class on a project with project invoicing off. The opportunities you choose to invoice must have the same organization, billing address, and tax class against them. The invoice is created using the details from the first opportunity, e.g. the subject, reference, organization, store, tax class, billing address, and delivery address. Opportunities must be for the same store or the stores must have addresses that would result in the same tax rates being used. Opportunities must have the same delivery address or delivery addresses that would result in the same tax rates being used, e.g. depending on how you have your tax rules set up, they might need to be in the same state when there are different tax rates for those states.